Donald Trump. Or Hillary Clinton. You don't have to like it. In fact, you probably don't. Sure, Clinton has supporters who see a pragmatic leader wielding a rock-solid résumé and a clear-eyed, no-nonsense vision. And Trump has those who see a brash winner willing to bash through all the dainty niceties in order to, say it with me, Make America Great Again. But the polls show they're the two least popular candidates in history: Only 38 percent of voters have a favorable opinion of Trump, while only 41 percent have a favorable view of Clinton. 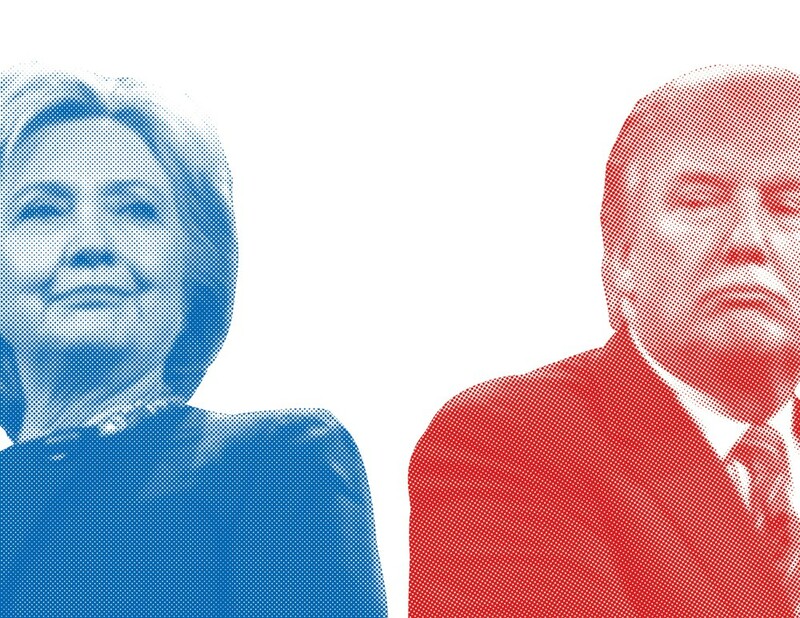 For that, you could blame partisanship, media bias or sexism — or the candidates themselves. For a lot of voters, Clinton represents everything they hate about politicians. For 25 years, her reputation has soaked in the Clinton brine of scandal, and almost-scandal and smells-like scandal, from cattle futures to real estate to the Lincoln Bedroom to private email servers. She's dogged by slimy sycophants, shady access-seekers, quarter-million-dollar Wall Street speeches and her support for the Iraq War. Trump, meanwhile, represents everything voters hate about hate. He rose to political prominence by falsely claiming the first black president was born in Kenya, launched his campaign by calling Mexican immigrants rapists and attracted a horde of bigots who bury Trump's critics under a deluge of racist and anti-Semitic tweets. Clinton's record of secrets, dodges and half-truths is infamous. But Trump's lies, on Iraq and cheering Muslims and crime and immigration, are shameless: They come in gold-gilded capital letters. No surprise, then, that a Quinnipiac poll last week found that half of Trump supporters consider him simply the "lesser of two evils" while 38 percent of Clinton supporters consider her the "lesser of two evils." With the election tightening, voters in swing states like North Carolina, Ohio and especially Florida will have to make a choice: "Want to stop a liberal Supreme Court?" conservatives ask. "Hold your nose and vote Trump." "Want to prevent, you know, a nuclear war?" liberals ask. "Hold your nose and vote Clinton." But here's an upside: Washington and Idaho aren't swing states. Polling forecasting site FiveThirtyEight has Clinton 12 points ahead in Washington, and Trump 21 points ahead in Idaho. Washington going red or Idaho going blue would mean such an apocalyptic landslide as to make either state irrelevant. The lack of electoral power is its own kind of freedom: You can vote how you want to vote. That doesn't mean your vote is useless. Far from it. A vote sends a message. Voting for Trump or Clinton tells future candidates they should be more like Trump or Clinton if they want your vote. Voting third party — or leaving president blank or writing in "Garbage-Eating Goat" — tells future candidates that you want something else. So go ahead: Follow your heart. In Idaho and Washington, you can afford to. In the race for the presidency, Hillary Clinton has positioned herself as everything her Republican rival Donald Trump is not: prudent, tested, studious and diplomatic. Over the years, Clinton has been praised as a knowledgeable and hardworking politician who's been a champion for women and children, helping craft the State Children's Health Insurance Program that expanded medical coverage for kids. But she's been criticized for being aloof, shifting her political views, her closeness to Wall Street and her hawkish foreign policy. EARLY DAYS: Born in Chicago in 1947, Hillary Rodham was raised in the suburbs in a Republican household. She graduated from all-women's Wellesley College in 1969 and Yale Law School in 1973. GOING SOUTH: While in law school, she met her future husband and future president Bill Clinton, who convinced her to move to his home state of Arkansas. Rodham wouldn't take the last name Clinton until 1982; using her maiden name had become an issue in her husband's first term as governor and unsuccessful 1980 re-election campaign. In Arkansas, she founded a nonprofit advocating on behalf of children and families, became the first woman to make partner at a prestigious law firm and served on Walmart's corporate board. HEAD TO WASHINGTON: In 1992, Bill Clinton was elected president. Hillary had an unusually large role in crafting policy for a First Lady and became a polarizing celebrity. While in office, the Clintons became targets for conservatives, prompting Hillary to claim there was a "vast right-wing conspiracy" against them. In 2000, Bill's last full year in office, Hillary was elected U.S. senator from New York, becoming the first First Lady elected to public office. 'I WILL BE THE NOMINEE': In 2007, the worst-kept secret in American politics came out when Clinton announced her bid for president, declaring in an interview that there was "no way" she wouldn't be the Democratic nominee. She lost the 2008 nomination to Barack Obama, an upstart senator from Illinois, who, as president, would make Clinton his Secretary of State. SECOND TIME'S A CHARM: After warding off a challenge from Vermont Sen. Bernie Sanders, Clinton clinched the Democratic presidential nomination this summer, becoming the first female nominee of a major American political party. He's loud and abrasive. He's easily offended but not afraid to offend. He believes political correctness is for the birds, and he loves winning. Nobody wins better than him. Nobody. Just ask him. He's been called a "brilliant salesman," a narcissist, an entrepreneur, a bigot, a misogynist, a hard worker, a "roguish charmer," a bully and in a 1997 New Yorker profile, "an existence unmolested by the rumbling of a soul." From real estate mogul to reality TV star, he's the first non-politician to win a major party's nomination in decades. THE TRUMP DYNASTY: Trump's grandfather immigrated from Germany in 1885. Friedrich Trump arrived in Manhattan with a single suitcase, changed his first name to the more Americanized version (Frederick) and enjoyed a career as a restaurateur, saloonkeeper, hotelier, gold rush prospector and real estate investor before his death in 1918. Granddad Trump passed on his business to his 12-year-old son, Fred, who taught his son the family business. BILLION DOLLAR MAN: Trump is worth an estimated $4.5 billion, according to Forbes. Although Trump claims he is worth $10 billion. TILL DEATH DO THEY PART: Trump has been married three times, and if elected he will be the only U.S. president with multiple failed marriages. The Huffington Post compiled a dandy collection of "absurd things Donald Trump has said about marriage," including this: "For a man to be successful, he needs support at home, just like my father had from my mother, not someone who is always griping and bitching." HE EATS AT WENDY'S: During an interview on the The Tonight Show Starring Jimmy Fallon, Trump said he likes to eat fast food because "at least you know what you're getting. I don't want to go into a restaurant and say, 'Mr. Trump would like a hamburger to go.' Now, I don't know what they're going to do to that hamburger. If they like me, I'm happy. If they don't like me... So I'm better off with fast food." A recent physical showed that the 70-year-old Trump is "slightly overweight" at 236 pounds and takes cholesterol medication. MASTER DELEGATOR: Indiana Gov. Mike Pence stands to possibly be the most powerful vice president in history. According to a New York Times Magazine article, Trump's son, Donald Jr., was in charge of vetting possible running mates. The young Trump reportedly called and offered the position to Ohio Gov. John Kasich soon after he dropped out of the presidential race. Trump Jr. explained that his father intended to delegate all foreign and domestic policy to his VP. Trump's job if elected? "Making America great again."